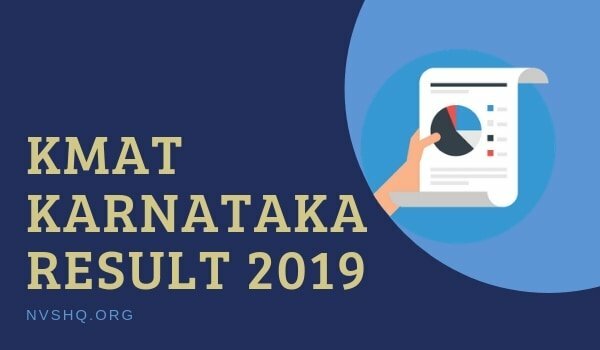 KMAT Result 2019: The Karnataka Management Admission Test (KMAT) is a state level entrance test conducted for the admission in various courses of MBA/PGDM and MCA. Test takers who appeared are now looking for KMAT 2019 Karnataka Result. Candidates can check result online or get it through the direct link provided here. Read more about the Karnataka Management Admission Test result 2019 below. The best part of KAMT is that its score is calculated without any negative marking for the wrong answers so applicants can do the guesswork in this exam. Here we have compiled all the important information related to KAMT 2019 result and the selection process after result declaration. Read it carefully to understand everything about the KMAT Karnataka 2019 exam. KMAT is the gateway for the candidates who want to take admission in the government and private MBA and MCA colleges of Karnataka state. The KAMT is conducted by the University of Karnataka. The registration for KAMT 2019 will start from May 2019 and exam for KMAT will fall in the month of August. KAMT 2019 result will be declared in the last week of August 2019. 2 How to Check KMAT 2019 Result ? The KMAT result 2019 will decide the future of many MBA, MCA aspirants. Karnataka Private Post Graduate Colleges Association (KPPGCA), the organizer for KAMT exam 2019, will declare KMAT result 2019 online. This year the candidates, who will appear in the KAMT 2019 exam, will not get the KMAT scorecard by post. The Karnataka Private Post Graduate Colleges Association (KPPGCA) will upload the scorecards of all the candidates online. How to Check KMAT 2019 Result ? The KMAT 2019 result will be published on its official website. To check the KAMT 2019 result, first click on the Result option, given in the notification tab on http://www.kmatindia.com. Once the result of KAMT 2019 will be declared the tab will become active. To check the result of KAMT, candidates will have to fill their application number of KMAT 2019 along with their Date of Birth on the website. Check the filled details carefully before submitting it. Once you will click on submit button, your scorecard will appear on the screen. Save it and take a few printouts of this scorecard for future reference. Here you need to remember that it is just a scorecard and not the formal mark sheet. The official mark sheet of KMAT 2019 you will get later on, not with the declaration of result. You need to know one more important point related to KMAT 2019 that its score will be valid for one year only. The KMAT exam 2019 scorecard will also be available for download on its website for one year only. If you want to get a copy of your KMAT 2019 scorecard offline then you need to contact at the officials of KAMT to get an offline copy of it. Now, when you have got your scorecard in your hand and you are overwhelmed with your success in KAMT 2019, you will think about your next step. Here we will help you to know the further action that you need to do after the KAMT result 2019. Once the result of KAMT 2019 will be declared then the process for MBA admission will start in Karnataka. Your KMAT score will play an important role in your admission in MBA as all the institutes that give admission to KMAT applicants, have received your score already but still, you need to attach the hardcopy of your KMAT 2019 scorecard while applying for the admission in MBA course. KMAT selection procedure 2019 will start after all the institute affiliated to KPPGCA and accept KMAT score, announces the list of shortlisted candidates. The shortlisted candidates will get called for Group discussion and Personal Interview. These tests are a part of the final selection process. This process is not centralized and its conducted by the institute itself with its own process. Hence, this final process of admission may vary from one institute to another. A few B-schools may ask candidates to take essay writing test or written ability test (WAT). There is no Centralized counseling process for MBA/MCA after KAMT exam. The selection process for the students who wish to apply for MBA will be held in Bangalore and the rest of Karnataka at the respective institute where candidate applies for admission. All the University affiliated, autonomous, or other AICTE approved private PGDM institutes accepting KMAT 2019 score may have different dates for the counseling of the MBA aspirants. The counseling dates for admission on the respective institute will be available on their websites. If you want to get admission to post-graduate programmes such as MBA, MCA or PGDM, then KAMT is the most suitable entrance exam for you. It is an easy exam that can land you in a good MBA or MCA college of Karnataka. The applicant’s age should be minimum 21 years to apply for KAMT 2019. No upper age limit is defined to apply for KAMT. If you want to apply for MBA or PGDM then you must have a Bachelor’s degree or Master’s degree from a recognised education body in any stream. To apply for KAMT 2019, the applicant must have scored at least 50% of marks in the aggregate in graduation. Candidates from SC and ST category can apply if they have scored at least 45% in their graduation. To apply for MCA must have Maths at 10+2 stage or at graduation level and you must have a Bachelor’s degree with 50% marks too. Applicants in their final year of Bachelor’s degree can also apply for KMAT 2019. There is a reservation policy for the candidates belonging to SC, ST, OBC, and PWD in KAMT. Here are the details of important dates associated with the KMAT 2019 exam and its result. The registration for KAMT 2019 will start in May 2019 and the online registration will continue till the last week of July 2019. KMAT 2019 applicants will get their admit cards by the first week of August 2019. The exam of KMAT 2019 will be conducted in the first week of August 2019. KMAT 2019 result will be declared by the last week of August 2019. A bank draft as per the guidelines mentioned in the KMAT 2019 Prospectus. You will have to carry all the original certificates and keep 2 photocopies of each with you so you could not rush for them if requires by the institute’s officials. So, here we have compiled every detail that you should know about KMAT 2019. If you have any question related to KAMT exam, KAMT 2019 result or any other topic, please feel free to ask us in the comment box below.